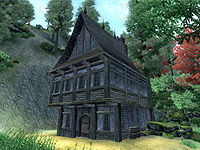 The house is often destroyed by an Oblivion Gate that spawns on top of it. This only happens if you approach the vicinity of the Isolated House some time after completing the Weynon Priory quest and before completing Light the Dragonfires. If an Oblivion Gate does spawn in the house, it provides a map marker for the otherwise-unmarked location. It is possible for the Oblivion Gate to spawn as you exit the house. This page was last modified on 28 September 2018, at 13:46.